We’ve made it to North Dakota! Our 17th state! In case you were wondering where Home on the Range is located… it’s here in North Dakota. We picked Medora as our one stay in North Dakota because of the Theodore Roosevelt National Park. 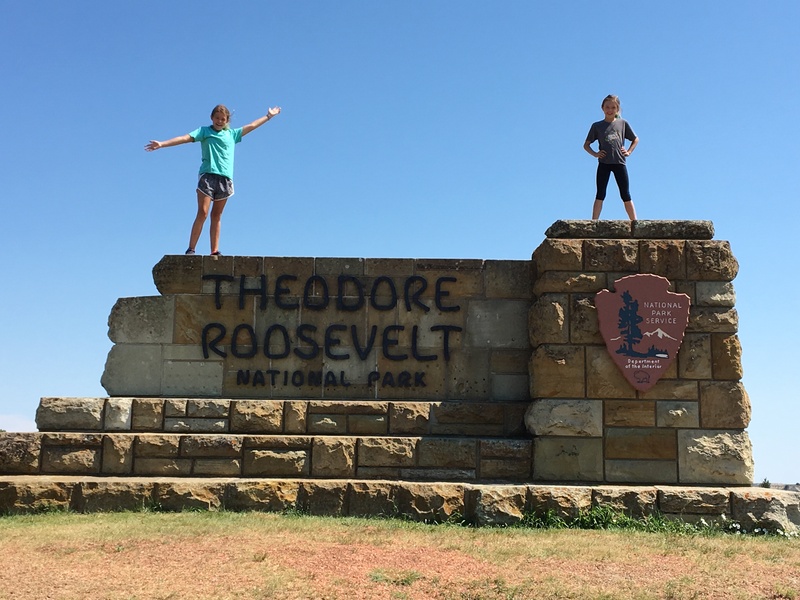 We stayed at the Medora RV campground right next to the South Unit (can ride bikes to the Visitor Center) of the Theodore Roosevelt NP in the town of Medora, ND. Sadly, we only had 3 days here because we had to stay in Billings for 3 days for the windshield repair. We were right on the Missouri River and loved this campground. The sunset colors against the butte were picture perfect. Each night we would take a walk down to the river to watch it. There is a playground on site but no pool. They told us we could drive over to the Badlands hotel to use their pool, so we did one afternoon. Abby was really into her book so she chose to sit and read next to me instead of playing in the pool. She has entered into the stage of uncertainty…uncertain as what age she is feeling from day to day, sometimes hour to hour. Sometimes she asks 15, sometimes she asks 10- it’s hard to watch her struggle with that. I want her to act like a young kid that doesn’t have a care in the world about what people think or how the world thinks she should act, just play. That’s what kids are suppose to do…play. Now, don’t get me wrong, I love that she likes to read but it’s a sunny warm day and there are kids in the pool. I resolved to the fact that somedays I feel like getting in the pool and splashing around with them and somedays I feel like laying on a lounge chair and reading as well so this is all normal. We will just sit in peace next to one another and watch her sister play. After about 30 minutes, a women walks over to me, points to Mackenzie and asks if she is mine. I look up from my book, and into the pool to see what Mackenzie is doing and have a decision to make as to whether I am going to claim her or not. She seems to be laughing and playing nicely with a young boy but I am still apprehension so I giggle, “Maybe after you tell me why you are asking and I will decide if I claim her or not.” She laughs back and then explains why she walked all the way across to the other side of the pool to ask me. She explains that her 9 year old son is extremely autistic and she has never seen him laugh and interact with another child like this before. She goes on to say that there is something special about my daughter that she was able to make a connection with him and he immediately started interacting with her. I looked up at her with watery eyes and said, “That’s my Mackenzie, thank you for coming over to share that with me.” We chatted for a bit and went back over to her table at the other side of the pool with her family and tended to her youngest of 4 children. I told Mackenzie what the lady said during a snack break and she was taken back by it. She explained that she noticed he didn’t really talk to her but he laughed a lot and they had fun chasing and splashing each other. After the snack she got back in and so did the boy. I put my book down and just watched Mackenzie play with him for the remainder of our pool visit. Thought the years, I’ve witnessed Abby’s sweet kind-hearted nature, it warmed my heart today to see Mackenzie shine brighter than the sun. I’ve been blessed with two gracious, tender, thoughtful, loving, beautiful daughters. This park lies in western North Dakota, where the Great Plains meet the Badlands. The park has 3 sections but is most known for the South Unit’s colorful Painted Canyon and the Maltese Cross Cabin, where President Roosevelt once lived. The 36-mile Scenic Loop Drive winds past several overlooks and trails. On Thursday, the girls and I visited the South Unit visitors center to watch the film, explore the museum and get the junior ranger books. We attended a ranger led talk in front of T.R.’s Maltese cross Cabin and learned all about his ranching days. Before the talk, the ranger asked us to introduce ourselves so afterward a family that is traveling the country in an RV with two boys, 12 and 4, came over and introduced themselves. We had a nice chat while the kids talked and played. The landscape here and strenuous life that TR experienced here helped shape his conservation policy that we still benefit from today. Before TR became our youngest ever (26th) president he spent time grieving, from the loss of his mother and wife, out here in North Dakota. He has said that without his time here in the badlands, he would have never become president. Conservation increasingly became one of Roosevelt’s main concerns. After becoming president in 1901, Roosevelt used his authority to protect wildlife and public lands by creating the United States Forest Service (USFS) and establishing 150 national forests, 51 federal bird reserves, 4 national game preserves, 5 national parks, and 18 national monuments by enabling the 1906 American Antiquities Act (that’s about 230 million acres of public land). We also drove out the painted canyon where we stopped at the visitors center. There is a small gift shop, a ranger on duty to answer questions and a passport stamp but that’s about it. If you are strapped for time, I’d skip this. The overlook was nice but the next day when we drove the 36 mile scenic loop we saw similar terrain. Friday the town was having a big event called The Gathering of the Roosevelt’s. We saw the flyer at the ice cream and fudge shop. The girls and I went to an event at 10:00am called Games with the Roosevelt’s. The actor playing President Roosevelt did a great job. You can see the actor portraying, his youngest son, Quentin, in the background. We felt like Ben Stiller in Night of the Museum (which we watched again this week). We loved the game of trying to get the egg the next cup by blowing on it. Friday evening, after Chris was done working, we drove the Scenic Loop Drive. We throughly enjoyed watching the prairie dogs popping out of their burrows in Prairie Town and spotting a wild horse on top of a butte. We hiked Coal Vein Trail and saw bison and bison chips (dung). Children on the Oregon trial would collect these bison chips for fire starters and play ‘toss the chips’ back and forth over the wagons. On the way out of the park, our highlight was getting into a bison jam for 20 minutes. After the jam, we were able to continue down the road…only to find one lone Bison trying to catch up with his herd. It was up hill after all. We also saw a Bald Eagle… nothing more American than Bald Eagles and Bison! We have a long drive to Minnesota so we stayed overnight in Jamestown, ND (see next post). If you’ve noticed there aren’t as many pics of Abby, she has started a new ‘don’t take a picture of me’ stage. The joys of adolescents. I never been to ND but the park looks stunning. So maybe I should try to get there one day. hate it – I never go to Cold Places during the Winter. Denmark is already too Cold for me. Give Mackenzie a big hug from her Grandpa Tim and Grandma Karen! You have two beautiful daughters both inside and out. The northern Badlands were among my favorite parts of my trip in 2017. It was a last minute decision to make the detour over to the Theodore Roosevelt National Park and do some backcountry camping there. This was in October of 2017, it was cold and wet when the sun went down, but I got a good tan going during the days. Awesome place, with lots of wildlife and a huge variety of grass. Beware of the mud if you’re on a long hike! And beware of any blind turns, there could be a sleeping bison just around the corner, I had my fare share of close calls! That said, great post, loved it, I relieved my time there while reading yours. Great advice! I’m glad you were able to explore that area!